Our obsession towards celebrity style is quite unhealthy sometime. Those who have been following our blog would know this already. We just can’t stop our urge to find out what style stars are up to in their latest outfits. And when we do spot a dress which would offer us plenty of ideas that can be incorporated in our own traditional style, then we do end up crafting a post a share the sweet news with you. That’s the motto behind this post. 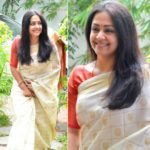 That is to take a look on celebrities who took us by surprise by their fine silk saree choices this week. 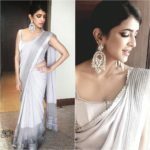 More than the saree, we are quite surprised to see them wearing a similar jewellery trend to prove the point what accessory is being fancied by fashion loving women like them. The celebs in talk are Kajal Aggarwal, Rashi Khanna and Pragya Jaiswal. 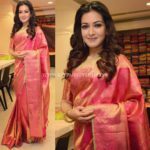 These pretty women were recently spotted in various events wearing traditional silk saree with antique accessories. To be specific all the three wore a bold pair of jhumkas with a catching neck piece. Now, time to take a closer look on who wore what! What do you think of their saree style? Who is your favorite? Drop your comments and let us know. This Week Celebrity Shows How To Rock in Simple Sarees! Samantha Gives Saree Style a Stylish Twist! Samantha Saree Style: 35 Fabulous Sarees Flaunted by Samantha! Next articleBefore You Wrap Up Diwali Shopping, Check This Brand!